Persistence Market Research presents an in-depth analysis of the billion dollar non-alcoholic beverages market in a new publication titled “Non-alcoholic Beverages Market: Global Industry Analysis (2012 – 2016) & Forecast (2017 – 2027).” In this report, the global non-alcoholic beverages market has been segmented on the basis of product type, source, packaging, distribution channel, and region to present a comprehensive picture of the consumption and revenue growth of non-alcoholic beverages across the globe. During the research process, we have taken into account the various factors likely to influence the global non-alcoholic beverages market for a duration of 10 years from 2017 to 2027. Our forecast assumptions for this period are based on a historical study of the global non-alcoholic beverages market for the period 2012 to 2016, which serves as a benchmark for estimating the volume projections and revenue size of the global non-alcoholic beverages market for the said period of study. The executive summary captures the gist of the global non-alcoholic beverages market for the benefit of our readers, who can get a bird’s eye view of the global non-alcoholic beverages market ecosystem in a nutshell in this section. The executive summary comprises a market overview and our analysis and recommendations. The market introduction section comprises the market definition and taxonomy. In the market overview chapter, we focus on the forecast factors, the global non-alcoholic beverages market value chain, and import and export trends governing the global non-alcoholic beverages market. The next section presents the global non-alcoholic beverages market analysis scenario with market volume analysis and market value and absolute $ opportunity analysis. The next few sections detail the global non-alcoholic beverages market forecast and market attractiveness analysis by product type, source, packaging, distribution channel, and region. This is followed by the regional forecasts of the non-alcoholic beverages market. Here, we highlight the regional market dynamics and impact analysis of the regional drivers, restraints, and trends. One of the key sections of the report features the competitive landscape of the global non-alcoholic beverages market. Here, we have profiled some of the key players with a presence in the global non-alcoholic beverages market. This section is intended to serve as a dashboard view of the competition present in the global non-alcoholic beverages market. Our aim is to help new market entrants as well as existing stakeholders understand the level of competition present in the global non-alcoholic beverages market. We have covered the different companies’ business overview, key financials, growth strategies, and recent market developments to present a clear picture of the key player market structure. Persistence Market Research deploys a tried and tested methodology to determine the global market estimations in all our reports. Our exhaustive research methodology begins with market profiling where we deploy in-depth secondary research to ascertain the overall market size; determine top industry players, products, applications, and industry connotations; and identify manufacturers, distributors, and other key stakeholders present in the global non-alcoholic beverages market. For primary research, we formulate a detailed discussion guide and build a list of respondents. Data thus collected through primary and secondary research is validated using the triangulation method and further scrutinized using advanced company tools to glean pertinent insights into the global non-alcoholic beverages market. Non-alcoholic beverages are fast gaining popularity in Asia Pacific, owing to a growing consumption of tea and coffee in the region, particularly in countries like India. The consumption of non-alcoholic beverages in Asia Pacific stood at 200 Bn liters in 2016 and this is expected to increase to 301 Bn liters by the end of the forecast period in 2027. North America is a close second in terms of non-alcoholic beverages consumption, with a recorded 169 Bn liters in 2016 expected to increase to 256 Bn liters by the end of 2027. Consumers in North America are moving towards a healthier lifestyle and seem to prefer sports and energy drinks to keep themselves fit and hydrated through the day. This factor is primarily responsible for the boost in consumption of non-alcoholic beverages across the region. In terms of volume CAGR, both Asia Pacific and North America are slated to witness a growth rate of 3.9% over the forecast period. 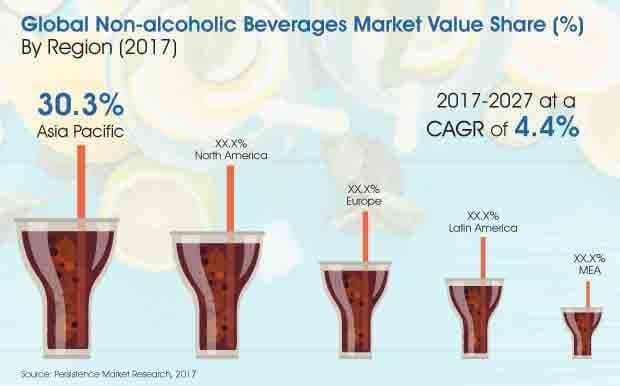 The billion dollar global non-alcoholic beverages market is highly concentrated in these two regions, with Asia Pacific estimated to reach a market valuation in excess of US$ 650 Bn by 2027 end and North America anticipated to cross US$ 600 Bn towards the close of 2027. While Asia Pacific will register a value CAGR of 4.6%, North America will record 4.7% during the decadal study. North America: Health conscious Americans are looking for healthy alternatives to traditional soda beverages and this has prompted non-alcoholic beverages manufacturers to launch innovative products such as cold-pressed juices, craft sodas, and other low-calorie beverages. New flavors of sparkling water and energy drinks are fast replacing soda beverages in the region. Also, North America is witnessing a rapid growth in the functional beverages segment. Beverages double up as guilt-free snacks, drinkable breakfasts, or even meal replacements. With consumers in North America demanding more nutritious, alcohol-free beverages, there has been a sharp rise in naturally produced functional beverages with inherent benefits such as blood sugar management, energy, refreshment, and immunity boosting properties. Asia Pacific: The Asia Pacific region is witnessing an increased consumption of protein drinks, and this is not limited to just athletes and sportspeople. Women and senior citizens across the region are also showing an inclination towards protein drinks owing to health and wellness trends prevalent among the general population, especially among working women and the health conscious geriatric population in Asia Pacific. Further, there is a high preference for soft drinks among the young population in Asia Pacific. The APAC region supposedly offers the best income growth prospects in the world, and several young professionals from different parts of the world are moving to Asia Pacific for career prospects. This has fueled the demand for and consumption of RTD beverages and soft drinks as well as healthier functional beverages among the millennial working class. Europe: Europe is the third largest consumer of non-alcoholic beverages after Asia Pacific and North America and the primary reason for this is an increasing consumer shift towards non-alcoholic beverages and a growing popularity of specialty tea across the region. In Europe, an emerging trend of adult or spicy drinks is being noticed of late. Spices are no longer used only in cooking; today, spices find application in non-alcoholic drinks production as well. Spices such as chili and ginger provide strong flavors to non-alcoholic beverages and are preferred by health conscious people who wish to avoid alcoholic and sugary beverages. This increasing preference for adult drinks has boosted market demand and subsequently production in the Europe non-alcoholic beverages market. Further, European consumers are shying away from sugar in a bid to promote a healthy lifestyle, and this has negatively impacted the sales of non-alcoholic beverages in the region. To boost sales and increase market share, non-alcoholic beverages manufacturers in Europe are launching old consumer favorites with a new touch and flavor. The launch of non-GMO labeled Tropicana is a classic example. Fraser & Neave Holdings Bhd.